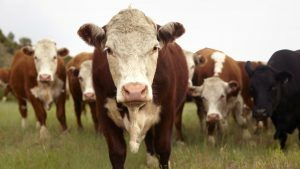 Cattle Commentary: Cattle futures were mixed today with front month futures trading lower to the deferred higher prices; this indicates that managed money is now starting to roll some of their net long positions out. February live cattle finished the day down .475 at 122.875, trading in a range of .975 on the day. March feeder cattle were .225 lower at 146.65, trading in a range of .975 on the session. Todays Fed Cattle Exchange had 388 offered but yielded zero sales. The bulk of last week’s cash trade came in around 123, there have been calls for 1-2 higher, we don’t see much more than 1 at this point. Colder temperatures have helped offer support to the market but forecasts are turning “warmer” through some key areas which will start to help with weight gain. Boxed beef has been working higher yet again. February live cattle futures struggled again to get traction above our resistance pocket from 123.35-123.80. If we fail to breakout above this pocket in tomorrow’s session we will be looking for futures to retreat back towards 120.10-120.70; this pocket represents the 100-day moving average and the 50% retracement (middle of the range) from the August lows to the November highs. We look at this as an opportunity to reduce long exposure and leg back into some hedges. If the bulls can achieve a conviction close above resistance tomorrow there is not a lot stopping the market from running to 126.65-126.775. This pocket represents a key Fibonacci retracement along with previous highs from the failure at the end of November. In yesterday’s report we mentioned there being an opportunity to reduce long exposure in our resistance pocket from 146.45-146.85, we continue to believe that to be the case. This pocket represents the middle of the range from the August lows to November highs as well as the 100-day moving average. The market finished the session in-between our pocket after failing to take out yesterday’s highs. If the market fails to achieve a conviction close above resistance, we could see some long liquidation from funds who have capitalized on a very nice run over the past two weeks. A failure opens the door to close the gap at 143.05-143.55. February lean hog futures took a stab at our first technical support at 70.30 but failed to see follow through selling, marking a low of 70.20. Futures ended the day up .35 at 71.075, trading in a range of 1.00 for the session. Colder temperatures are said to be helping support the market but intermediate term fundamentals could be keeping a lid on any significant rally from here. Although we did finish off the lows we are still skeptical of how much more room this market can run to the upside. Key technical resistance comes in from 72.25-72.45, a failure to break out above this pocket could lead to long liquidation from the funds and press us back towards the low end of the range near 67 which is our target for the time being.